Submitted 4 months 2 weeks ago by feeds user. 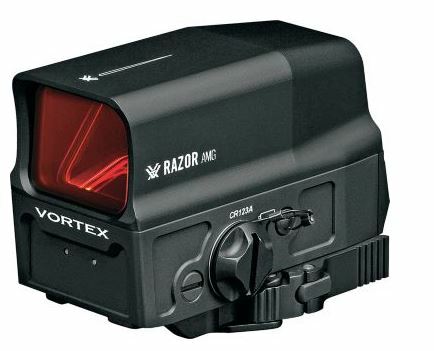 Vortex® Razor® AMG™ UH-1™ Holographic Sight Battle-tough, energy-efficient holographic sight Expansive sight picture and unlimited eye relief ArmorTek ultrahard, scratch-resistant lens coating Shatterproof XR Plus multicoated windows and holographic elements FHQ technology eliminates stray light emissions With the introduction of the battle-tough, energy-efficient Razor AMG UH-1 Holograghic Sight, Vortex advances the evolution of holographic sights. It's the first sight of its kind to match the durability and reliable efficiency of a red-dot sight with the expansive sight picture, unlimited eye relief, zero distortion and reticle pattern of a holographic sight for instinctual target acquisition. Shatterproof XR Plus fully multicoated windows and holographic elements promote optimal light transmission. ArmorTek ultrahard, scratch-resistant coating protects exterior lenses from scratches, oil and dirt. Anti-reflective lens coatings on every lens surface increase brightness. FHQ™ technology eliminates stray light emissions and prevents eyepiece glare common to other holographic sights. All sensitive components come protected in the base of the sight to withstand the roughest handling. Select between 15 brightness settings to best match conditions using the rear-facing controls. Integrated mount quickly attaches to any Weaver or Picatinny rail. Argon-gas-purged sight housing delivers water- and fogproof performance. Uses one CR-123A battery (included). Can also be powered by LFP123A rechargeable battery using the micro-USB port for charging. Backed by the Vortex VIP unlimited lifetime warranty. Cancer and Reproductive Harm- www.P65Warnings.ca.gov.